A rabbi and one of the most eminent Talmudists of his age; born in Lithuania at the end of the seventeenth century; died at Metz June 23, 1785. He was rabbi in Pinsk, and, later, president of the yeshibah in Minsk. In 1765 he was called as rabbi to Metz, then one of the most important congregations in Europe. His election was confirmed by royal decree October, 1766. While his confirmation was still pending, a serious trouble broke out in the synagogue, which nearly brought about his resignation. He opposed this practise of the congregation: On Pentecost it was customary in Metz to recite the hymn Aḳdamut, after the reading of the first verse of the Pentateuch-lesson. The rabbi objected to this interruption of Scripture, reading, and ordered the reader to proceed, but the trustees defied his authority and insisted on the traditional usage. A violent scene followed, and the rabbi was compelled to leave the synagogue. Henever afterward entered it except to deliver his sermons, four times a year; but at the request of members of the congregation who regretted their action on the occasion of the discreditable disturbance in the synagogue, he remained in the rabbinate till his death. Aryeh Loeb was considered one of the keenest casuists of his time (see Azulai, "Shem ha-Gedolim" s.v. "Shaägat Aryeh"). His yeshibah was well frequented; and he lectured even when, toward the end of his life, he became totally blind. His chief work, "Shaägat Aryeh" (The Roaring of the Lion), is considered a classic in casuistic literature. It was published at Frankfort-on-the-Oder, 1755; Brünn, 1796; Slavita, 1833; with glosses by Moses Aryeh Loeb ben Joshua of Wilna, Josefow, 1855; and Wilna, 1874, with additions from the author's manuscripts and glosses by his son Asher Loew. In 1781 Aryeh Loeb published a work containing glosses to the Talmudic treatises Rosh ha-Shanah, Ḥagigah, and Megillah, together with miscellaneous casuistic novellæ, under the title "Ṭure Eben" (Rows of Stones). 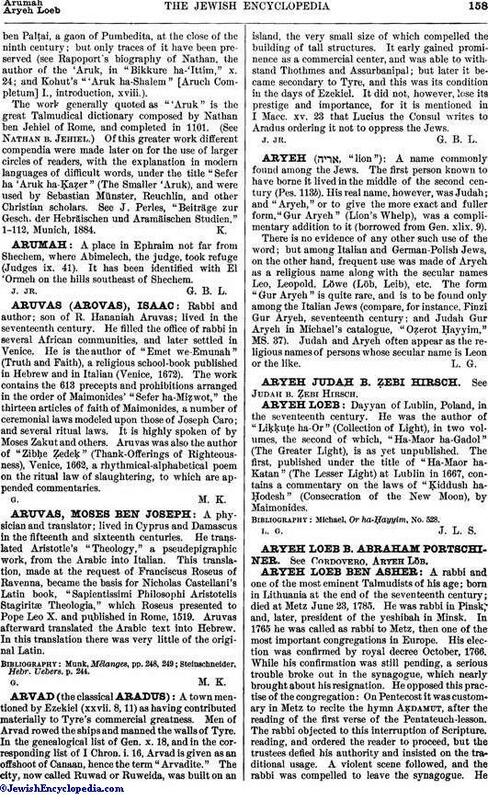 A supplement, containing glosses to Ta'anit, was published at Wilna in 1862 under the title "Geburat Ari" (The Strength of the Lion). Responsa of his are also found in the collection on the divorce-suit of Cleve. He was an advocate of the strictest orthodoxy and a type of the casuist that never can accept any exposition of a passage but the literal sense. When the Talmud, for example, calls Nebuchadnezzar (Ḥag. 13a) "the wicked, the son of the wicked, the grandson of Nimrod the wicked," Aryeh Loeb would not accept the explanation that Nebuchadnezzar is called Nimrod's descendant on account of his being of similar character, but insists that Nebuchadnezzar was, on the maternal side, a descendant of Nimrod (see "Ṭure Eben," 19b). Aryeh Loeb is officially called Lion Asser, which means Lion (French for Loeb), son of Asher. 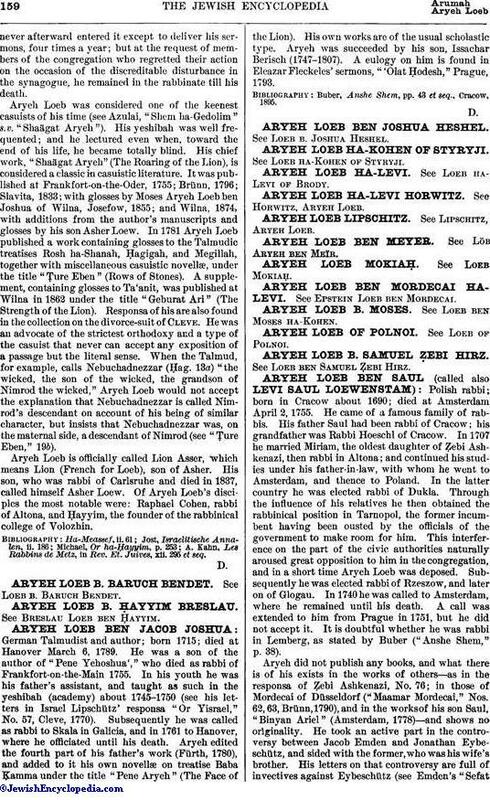 His son, who was rabbi of Carlsruhe and died in 1837, called himself Asher Loew. Of Aryeh Loeb's disciples the most notable were: Raphael Cohen, rabbi of Altona, and Ḥayyim, the founder of the rabbinical college of Volozhin. A. Kahn, Les Rabbins de Metz, in Rev. Et. Juives, xii. 295 et seq.